The USAID-funded Feed the Future Ghana Agriculture and Natural Resource Management Project (AgNRM) welcomed the USAID/Ghana Mission Director, Andrew Karas, to Dorimon, in the Wa West District of the Upper West Region. The paramount chief of Dorimon, Naa Sohimwininye Danaa Gori II received Mr. Karas on behalf of the people and applauded USAID’s efforts to reduce poverty and improve rural livelihoods in Northern Ghana. During the visit, Mr. Karas thanked the paramount chief for his cooperation with the AgNRM project and support to USAID in enhancing the livelihoods in Dorimon and surrounding communities. 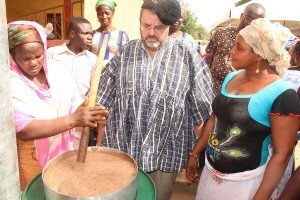 Through Feed the Future, the U.S. government’s global hunger and food security initiative, AgNRM aims to alleviate poverty in rural communities through increased incomes from natural resource products such as shea and moringa; improved food and nutrition security; increased farmer and community security/access to land and natural resources and strengthenedenvironmental stewardship. The project is working closely with the Dorimon Traditional Council to establish a Community Resource Management Area (CREMA) in Dorimon to empower community members to effectively manage their natural resources. The AgNRM project recently trained 170 women beneficiaries in Dorimon on the use of improved cook stove (InStove technology), which will make it safer and more convenient to process shea as opposed to traditional open-fire stoves. The AgNRM project also trained community members on adding value to moringa by processing the leaves and seed into oil, ointment, liquid and bar soaps and using the plant as a food supplement. Commenting on her new skills in making productive use of the moringa plant, another community member, Sauba Iddrisu, was excited that AgNRM is helping her and other women to develop economic activities using moringa. Mr. Karas also visited a home garden supported by the AgNRM project, belonging to Alima Sulemana who has secured full rights land from her husband. She can now dictate what crops to grow on the field with little interference from her husband or relatives. She has also adopted newtechnologies introduced by the AgNRM project which have helped her to improve soil fertility and enhanced the health of crops. Applying a bio-fermentation of waste materials from household waste mixed with animal droppings has Alima enthusiastic about improving the fertility of her plot. Mr. Karas was excited that women within Dorimon and its surrounding communities embraced the livelihood opportunities provided by USAID through the AgNRM project and congratulated Alima’s husband, the paramount chief and other male leaders for being change agents in their communities.